Light emitting diodes (LEDs) or solid state lighting is infiltrating many lighting markets. The rapid pace of adoption and technology innovation leaves many engineers and designers struggling to understand the basics of LED technology and how it differs from traditional light sources. Before adopting LEDs, it’s important to have a thorough understanding of their mechanics, differences, and the potential challenges they may present. In this article we’ll discuss LED color variability and how binning works. What is Solid State Lighting and how is it Different? Solid state lighting (SSL) produces light much differently than conventional light sources. Rather than directing current through a tungsten filament causing the metal to heat and thereby act like a blackbody radiator to emit light, SSL directs current through a semiconductor diode which then converts energy directly into light. Semiconductor materials contain positively charged carriers called “holes” and negatively charged carriers called electrons. When these materials combine, the result is known as a diode. As current passes through the diode, the positive holes and negative electrons are forced to move towards each other. Once they come into contact, the difference in their energy levels forces them to combine. The electron has a higher energy level than the hole and must release excess energy. This loss in energy is released as a photon or unit of light. The amount of energy released determines the wavelength (color) of light produced as well as the efficiency of the LED. Unlike conventional light sources which can only produce limited correlated color temperatures or spectral power distributions, LEDs can be tuned to a specific wavelength. In addition to the amount of energy released, color is also determined by the semiconductor material. Different materials emit different wavelengths of energy. To achieve specific colors, manufacturers use many different types of semiconductor materials; the most common include silicon, aluminum nitride, gallium nitride, and indium nitride. 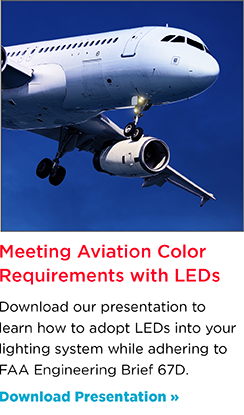 This provides many more color options and the flexibility to design for specific applications. While the ability to specifically tune LEDs creates many opportunities, engineers and designers should be aware that there can be significant color variability within the same LED product. The LED wafer, which is the base structure for the LED, is created by firing a mixture of gallium, arsenic, indium, and phosphor and heating it. This results in a cylindrical ingot that is then sliced into wafers. To create an emitting surface, thin layers of atoms are deposited onto the wafer’s surface. Each layer is extremely thin, sometimes less than one nanometer thick. This technique allows manufacturers to build complex semiconductor structures that have different properties. After deposition, the wafer is sliced into thousands of emitters or chips. A four inch wafer can be sliced into anywhere between 4,000 and 120,000 LED chips. A cathode and anode (electronic leads) are then adhered to the chip. Once in the finished housing, the LED is often covered in silicone for protection. Finally, in some cases an optic is placed over the housing to help direct the light output. LEDs are manufactured in a manner that promotes high throughput and low costs but these processes can create variability in the final product. The deposition process used to create the emitting surface can produce inconsistent results. When the wafer is sliced into individual chips, some chips may perform differently due to non-uniform deposition or changes in the manufacturing operating environment. To counter this inherent variability, LEDs are divided into groups known as bins. Binning groups together LEDs that have the same wavelength, flux, or voltage range. Buying LEDs from the same bin ensures they will have near similar performance. The human eye is incredibly sensitive; when observing green light it can easily detect 2nm – 3nm shifts in color. Sensitivity decreases for red light, but the eye can still detect shifts as small as 10nm. When lights are in close proximity to one another, like in airfield lighting, it’s critical that all of the lights in an installation emit the same color. If LEDs are selected from different bins, the resulting color can be different. For example, if one neighboring light fixture uses a blue LED from bin 01 (peak wavelength of 450nm) and the other uses a blue LED from bin 06 (peak wavelength of 465nm), the difference could be detectable. The difference in color can be confusing and lead pilots to misidentify features. When LEDs from different bins are used with the same cover glass, there can be shifts in chromaticity or decreases in transmission. Glass properties must also be considered when selecting LEDs; we compared two similar LEDs used with our aviation blue glass, K3124, to demonstrate the differences that can occur. The chromaticity coordinates can vary ±.020 and the transmission difference can be up to 10%. The difference in transmission could weaken the light intensity enough that the fixture no longer complies with the Federal Aviation Administration (FAA) light intensity requirements. In precision applications where it’s critical to emit a specific wavelength, these shifts can significantly impact quality. For instance, UV curing chemicals have been formulated for optimum wavelengths. If LEDs from different bins are used, the light that reaches the incident surface may not be optimized or in some cases even produce the necessary reaction within the chemicals to be cured. LED technology is rapidly developing and improving; products are quickly being replaced by the next best thing. Technology development often outpaces the lead times necessary for product design or installation. Lighting products and systems are often certified and approved using a specific LED; when the project moves to installation however, sometimes the original LED is no longer available. Design with interchangeability in mind. Make your designs flexible and plan for the worst case scenario. A deep understanding of LED technology, components, and their role in the lighting system can help. Increase manufacturing and testing standards. Raise awareness that standards and better testing methods are necessary to ensure consistency. Organizations like the Zhaga Consortium strive to standardize LED light engines and their associated components. Standardization simplifies LED luminaire design and helps engineers keep pace with technology development. While this doesn’t work for many applications, it can for products that have a long life expectancy and must use the certified light source, like an aircraft. In that instance, some manufacturers have purchased replacement LEDs to last them the life of the aircraft, approximately 25 years. Use quality, well-tested products and keep the data. Some LED light engine manufacturers conduct comprehensive testing on 100% of their product. Each light engine is tested for voltage, current readings, luminous flux, and color rendering index. Testing of this nature ensures that the LEDs they produce are consistent and that every LED in a bin performs exactly as expected. During this testing process, the LED manufacturer has the opportunity to store the characteristics of each LED bin in a database that can be accessed in the future. This enables designers to potentially find a close match if the historical LED is no longer available. To successfully adopt LEDs, it’s important to have a deep understanding of how binning works, both the opportunities it creates and the limitations it can impose. As manufacturing processes and testing improve, it will become easier, but for now we need to work within these constraints.